Catalog: "Anne Wilson: Wind/Rewind/Weave" is published by the Knoxville Museum of Art in conjunction with WhiteWalls Inc. and distributed by The University of Chicago Press. This 175-page publication includes essays by Glenn Adamson, Jenni Sorkin, Julia Bryan-Wilson, Philis Alvic, and Laura Y. Liu. The catalog is available for purchase through The University of Chicago Press. Knoxville, Tennessee, is located in the historical heartland of both hand weaving traditions and industrial textile manufacturing in the southeastern United States. 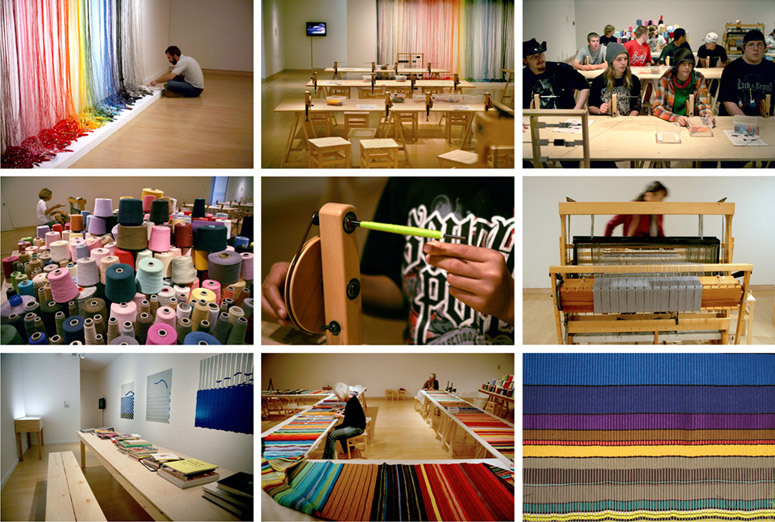 Conceived specifically for the Knoxville Museum of Art, Local Industry invited all museum visitors to consider textile production by spending time participating in the making of a woven cloth. Inside the museum factory, rows of hand bobbin winders recalled the group dynamics of both mill and workshop. Using fiber donated from U.S. textile companies, winding was open to all groups and individuals. Seventy-nine experienced weavers throughout the southeastern U.S. used the wound bobbins to collectively weave a single bolt of cloth on one loom inside the factory. Proceeding in sequence in a way related to exquisite corpse drawing, different weavers worked in 1 -2 day sessions over 3 months. The resulting cloth measures 24 inches wide x 75 feet 9 inches long and is now part of the permanent collection of the Knoxville Museum of Art. Over 2100 individuals comprise the Archive of Production which will always accompany the display of the cloth. A reading room adjacent to the Local Industry factory allowed for study of the many subjects related to the project. Local Industry was a team effort made possible by the participation of many individuals from Knoxville, Tennessee, Chicago, Illinois, and states throughout the southeastern United States. At the Knoxville Museum of Art I extend my sincerest gratitude to Chris Molinski (Curator), David Butler (Director), the entire museum staff, docents, and visitor service representatives who helped me realize this project. I also want to thank Local Industry Project Managers Libby O'Bryan in Chicago and Nick DeFord in Knoxville for their ongoing commitment. Thanks to David Willard and the Arrowmont School of Arts and Crafts for providing a loom; Kathrin Weber for selecting and preparing the loom for use; Ray Snyder, Carol Pritcher and the Tuesday Weavers from the Appalachian Arts Crafts Center for ongoing support, and Tommye Scanlin for her cloth finishing expertise. Special acknowledgement to all the participating weavers and the hundreds of bobbin winders who prepared bobbins for the weavers over the three months of the exhibition. Thanks to Christy Matson who created an amazing sound installation, Millsounds, for the exhibition and Isaac Facio whose wall drawings in the exhibition reading room enhanced the understanding of weave structure. I am also grateful to: Dan Wittenberg (lead sample weaver), Anne Larsen, Christopher Noey, Elise Stephens, Emily Nachison, Janette Ramirez (2nd lead sample weaver and instructor), Joan Livingstone, Kathryn Hixson, Kimberly Pence, Lynnette Miranda, Mark Anderson, Michael Hunter, Michael Milano, Michael Nagelbach, Olivia Valentine, Patricia Tinajero, Rosemary Lee, Sari Gunderson (compiled weaving facts), Spoke (Chicago), Susan Peterson, Suzanne Devan, Syniva Whitney, Tara Hills, the individuals and institutions who gave us permission to use photographs of weaving histories, and all the University of Tennessee students who assisted with installation. A. Lava & Son Co. Chicago, IL; Buhler Quality Yarns Corp, Jefferson, GA; Carolina Mills, Inc, Maiden, NC; Coats & Clark, Greet, SC; Glen Raven, Inc, Glen Raven, NC; Kimberly Pence, Chicago, IL; Leader Thread, New York, NY; Leigh Fibers, Spartanburg, SC; Mount Vernon Mills, Inc., Mauldin, SC; National Spinning Co., Washington, DC; Ohio Knitting Mills, Cleveland, OH; The Oriole Mill, Hendersonville, NC; Patrick Yarn Mills, Inc., Kings Mountain, NC; Raxon Fabrics Corporation, Allentown, PA; Sunbury Textile Mills, New York, NY and Sunbury, PA; The Thread Exchange, Weaverville, NC.